The preschool years are an exciting time at Westminster! Our energetic and enthusiastic students engage in multi-sensory and innovative practices designed to build the strong foundation needed for all future learning. These rich experiences will shape and mold the needed brain pathways and behavioral foundations that support preschool children's academic, emotional and social success. Our research-based approach to these early years is purposeful, thoughtful and child-centered. "Westminster is such a warm, loving place. From the little ones to the high schoolers, there's a sense of peace. Our son has learned so much already. We love his teachers. Well worth it!" In our Pre-Kindergarten class designed specifically for 3-year-olds, our youngest students experience the joy and excitement of an exceptional educational program in a nurturing and stimulating Christian environment. Centered around hands-on experiences and exploration, children will be active participants in their learning through games and activities, songs, movement, art and play as they begin their journey to becoming lifelong learners! Because age four is developmentally a dynamic and exuberant time, activities in our Pre-kindergarten classroom for 4-year-olds are geared toward keeping that enthusiasm for learning alive! Learning is accomplished through creativity and play, while challenging young minds and molding tender hearts. Your child will be introduced to many experiences in all subject areas, which emphasize the strong interests of this age. Transitional kindergarten serves young fives who demonstrate strong school readiness skills in many areas but may need the added benefit of an additional year of social, emotional, and cognitive growth. This class offers an advanced curriculum and enrichment opportunities to appropriately challenge the students at this developmental level. Modeled on the kindergarten day, these students enjoy the same opportunities for enrichment. In kindergarten, students enjoy the process of discovery and learning the basic building blocks of knowledge. Time is devoted to teaching appropriate classroom behavior to ensure the success of each student. Students also learn how to positively interact with classmates, teachers and the world. Bible stories from both the Old and New Testaments are woven throughout our activities each day. Christian truths and principles are integrated into daily lessons as students learn of God’s love through stories, songs, finger plays and drama. On Fridays, the PK3 class joins all of the Lower School students for chapel. This is one way our youngest preschool students are connected with the Westminster community. Students use a variety of tools and materials to develop fine motor skills. Chalk, paint, play dough, sand, markers, crayons and salt are used to strengthen muscles in the hands and fingers. Students are immersed in a language-rich environment daily as they are introduced to numerous pre-reading skills and concepts. Throughout the day, students listen to read-alouds, recite rhymes and poetry together, learn new finger plays, respond to choral readings and explore print in the world around them. Classroom activities build emerging literacy skills as students retell stories, role-play and sequence the events from their favorite books. Using a multitude of manipulatives, including building blocks, pattern blocks, shells, buttons, coins, and Unifix cubes, students explore the world of mathematics. Students learn to create, identify, copy and extend patterns as they develop a fundamental understanding of God’s order and design in His world, creating a strong mathematical foundation for our students. We recognize that children are scientists by nature. PK3 students gain a hands-on understanding of God’s world as they participate in water play, experiments with light and sound, plants, animals and cooking activities. Students celebrate their unique gifts and talents as we learn about each student and their special place in their family and in God’s world. The “Walking with God and His People” Bible curriculum teaches who God is and His desire for a relationship with us. Through Scripture memory, songs and Bible stories, the children build the foundation for a lifetime of knowing and walking with the Lord. On Fridays, the PK4 class joins with all of the Lower School students for chapel. This is one way our youngest students are connected with the Westminster community. Pre-reading skills and concepts are introduced, in order to lay the foundation for your child’s future success in the area of reading and language arts. Daily lessons focus on the four key pre-reading skills: phonological awareness, alphabet recognition, print awareness and oral language. The PK4 language curriculum builds cultural literacy and a strong vocabulary. Students are exposed to classic tales, multicultural stories, nursery rhymes, poems and songs each week. Retelling cards are used with the literature to increase vocabulary and listening skills. 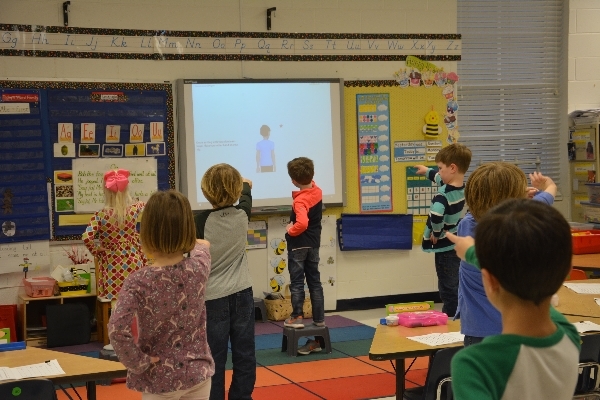 PK4 students practice public speaking through a weekly “Stand and Deliver” time. Microphone in hand, they have an opportunity to speak in front of their classmates about a topic they find exciting. After the speech, the “audience” has a chance to ask questions about the topic. Studies have shown that early math skills are the strongest predictors of a child’s math achievement in later years. The PK4 math curriculum develops a strong foundation in number sense, operations, geometry, spatial sense, measurement and data collection. This foundation is built through the use of hands-on manipulatives, movement, technology, exploration and repetition. Students explore the world through the science and social studies curriculum. Friends, family, food, neighborhoods, transportation and animals are some of the themes examined. 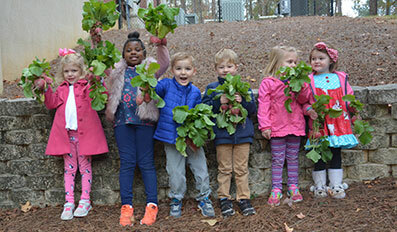 Additionally, the PK4 students engage with the beauty of God’s creation on our campus through nature hikes and creek crawls on Westminster’s trails. Preschool at Westminster is anything but typical. The TK students investigate various science and social studies units throughout the school year. These units coordinate with language arts, Bible or TK service projects and provide enhanced opportunities to better understand our community, country and world. Conveying the love and goodness of God are the primary goals of the Kindergarten Bible curriculum. Through stories of God’s work in the lives of Old and New Testament people, students learn to recognize God’s work and His plan in their own lives. On Fridays, the K class joins with all of the Lower School students for chapel. Each child in the early education division is partnered with a fifth-grade student as a chapel buddy. The “buddies” walk together to and from chapel and sit together as they worship. This is one way our youngest students are connected with the Westminster community. Kindergarten at Westminster provides students with a strong introduction to language through literature, print awareness, phonemic awareness, systematic phonic instruction, blends and fluency in reading. High-frequency words and predictable/decodable books are used for initial reading experiences. Children experience spoken language through large-group, small-group and individual activities. These activities are designed to promote comprehension, discussion and listening skills. Written language is experienced through dictation and daily creative writing. Technology allows our students to leave the confines of the classroom and explore our world. Our students are introduced to technology via SmartBoards and cameras in the whole-class setting and in small groups. Letter sounds, calendar time, specific units and handwriting practice come alive with use of these creative tools. NeuroNet, a research-based learning readiness program that facilitates learning through movement, is used in our early childhood department. This classroom enrichment is designed to help students develop essential skills in reading, math and handwriting.